ST. PETER, Minn. – The No. 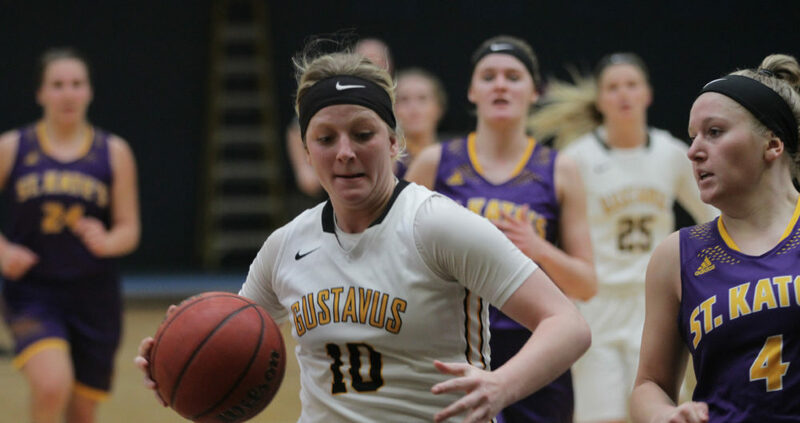 25-ranked Gustavus women’s basketball team outscored St. Catherine in all four quarters Saturday, cruising to a 67-40 victory at Gus Young Court. The Gusties also forced 29 turnovers and limited the Wildcats to 31.7 percent shooting to improve to 14-3 overall and 8-2 in the MIAC. After trading a couple points to start the game, Gustavus went on a 13-3 run to end the first quarter and never looked back. The Gusties continued to add to their lead in the second quarter and carried a 35-17 advantage into the locker room at halftime. Gustavus shot 50 percent (14-28) in the first half and held the visitors to 21.7 percent (5-23). The Black and Gold did not let off the gas in the second half, leading by as much as 30 (66-36) with 3:52 remaining in the game. Gustavus finished the game 51 percent (25-49) shooting from the field, including 5-of-11 from three-point range. The Gusties also shot 12-of-17 from the free throw line. St. Kate’s out-rebounded the Gusties 30-26, but gave up 40 points in the paint. Miranda Rice (Sr., Forest Lake, Minn.) led a trio of Gusties in double figure scoring with 18 points on 9-of-11 shooting from the field. Mikayla Miller (Sr., Goodhue, Minn.) and Kendall Thompson (Jr., Eden Prairie, Minn.) contributed 16 and 11 points, respectively. Gustavus has a much-anticipated rematch with league-leading St. Thomas on Wednesday night in St. Paul. The Tommies won the first game of the season series 74-66 on Dec. 13 in St. Peter.